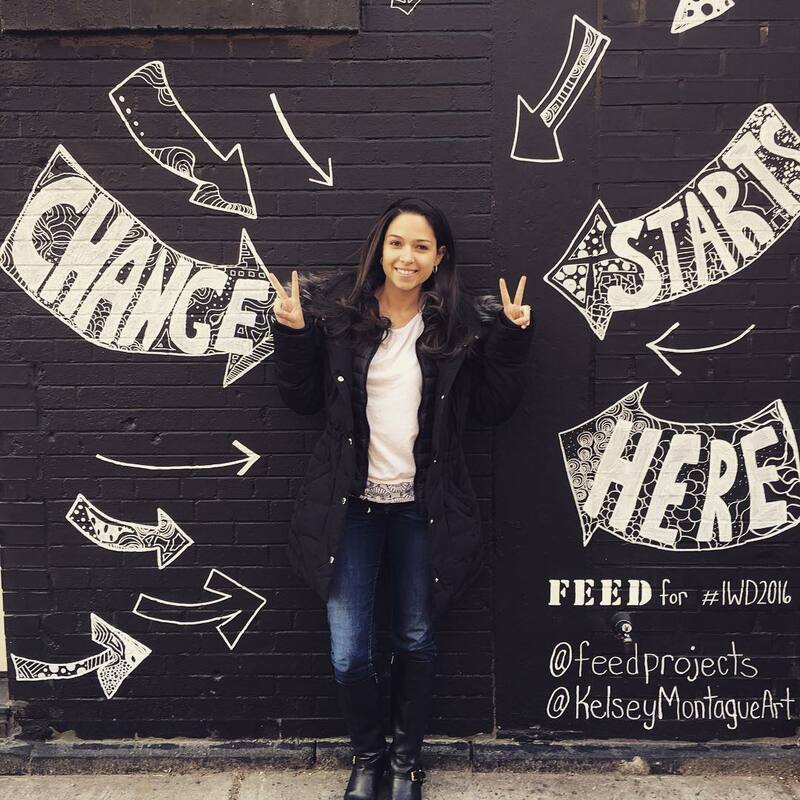 Kelsey Montague, the artist behind our Change Starts Here mural currently on display in SoHo, is a rising star in the street art world, which tends to be a male dominated industry. We sat down with her recently to learn more about her experience as an artist, and hear her perspective on the meaning behind Change Starts Here. How did you get your start in street art? My love of street art started when I discovered Banksy while I was in college in London. After my own art started to take shape, I continued to be attracted to large-scale pieces and particularly to ways that art can be interactive. After I moved to NYC I had the opportunity to create a large-scale piece in Nolita, Manhattan and decided to do Angel Wings. I wanted people to be able to step into my piece and look as if they were flying but more importantly, I wanted to give people the opportunity to reflect on what lifts them in their own lives. That is when I decided to attach the #WhatLiftsYou hashtag to the piece. I had no idea if people would like it or hate it but immediately people were sharing inspiration on the #WhatLiftsYou hashtag! Since then I’ve traveled the world creating uplifting and interactive pieces. Tell us a little bit about this specific piece at Little Cupcake Bakeshop. What feels special about the design and the outcome to you? I’m so excited about my piece with FEED! This piece was very different for me because I wasn’t using a metaphor image like wings to make a statement. Instead, I was creating a piece that was ALL about the person standing inside it. I love supporting an organization that has provided over 95 million meals to people around the world through commerce. Finish the sentence: "I want to live in a world where women and girls everywhere ...." Are treated equally and given the opportunity to live their dreams. What about your work or life right now contributes to that vision? My #WhatLiftsYou campaign is all about giving people a chance to reflect on what their dreams are made of. I also think working in a male dominated field (street art) makes me ultra aware of how difficult it can be to be a woman in certain fields. I often am criticized because I am not “street art enough’” because my work is hand-drawn, legally created and whimsical. I can’t wait for the day when women (and the way they create or execute their work) are accepted as equal to their male counterparts in all industries. Coloring is also meditative and great for mental health. I’m honored to be part of a group of illustrators that are creating peaceful moments for people around the world. We've loved all the snaps you guys have shared on Instagram this month inside Change Starts Here. A better world truly does start with each of us - wherever we are, with whatever we have.